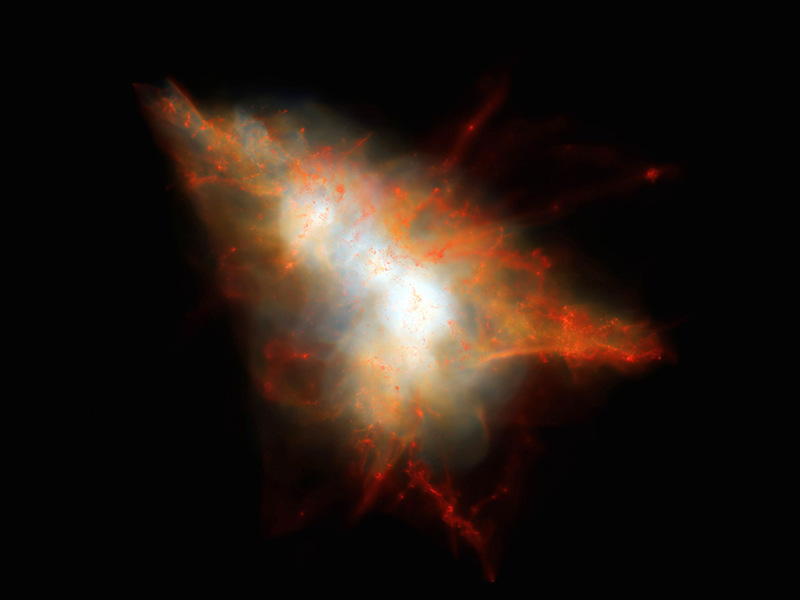 This snapshot is from a cosmological simulation of a Lyman-alpha Blob similar to LAB-1. 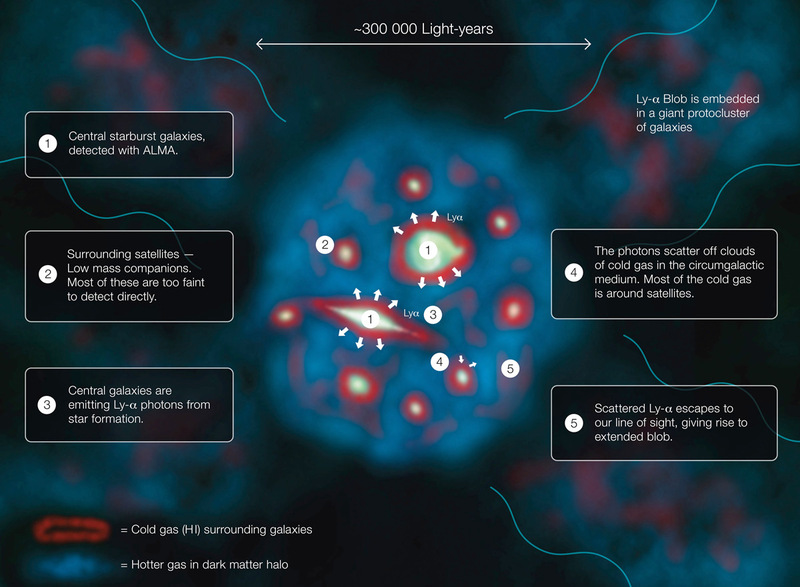 The simulation tracks the evolution of gas and dark matter using one of the latest models for galaxy formation running on the NASA Pleiades supercomputer. This view shows the distribution of gas within the dark matter halo, colour coded so that cold gas (mainly neutral hydrogen) appears red and hot gas appears white. Embedded at the centre of this system are two strongly star-forming galaxies, but these are surrounded by hot gas and many smaller satellite galaxies that appear as small red clumps of gas here. Lyman-alpha photons escape from the central galaxies and scatter off the cold gas associated with these satellites to give rise to an extended Lyman-alpha Blob. image credit: J.Geach/D.Narayanan/R.Crain. An international team of researchers using the Atacama Large Millimetre/submillimetre Array (ALMA) and other telescopes has discovered the power source illuminating a so-called Lyman-alpha Blob — a rare, brightly glowing, and enormous concentration of gas in the distant universe. Until now, astronomers wondered why these huge clouds of gas shined so brightly. The answer, in this example at least, appears to be two galaxies at the heart of the blob undergoing furious star formation and lighting up their surroundings. These large galaxies, which are destined to eventually merge into a single elliptical galaxy, are in the midst of a swarm of smaller galaxies. This appears to be an early phase in the formation of a massive cluster of galaxies. Lyman-alpha blobs (LABs) are gigantic clouds of hydrogen gas that can span hundreds of thousands of light-years and are found at very large cosmic distances. The name reflects the characteristic wavelength of ultraviolet light that they emit, known as Lyman-alpha radiation. Since their discovery, the processes that give rise to LABs have been an astronomical puzzle. New observations with ALMA have now cleared up the mystery. One of the largest Lyman-alpha blobs known, and the most thoroughly studied, is SSA22-Lyman-alpha Blob 1, or LAB-1. Embedded in the core of a huge cluster of galaxies in the early stages of formation, it was the very first such object to be discovered — in 2000 — and is located so far away that its light has taken about 11.5 billion years to reach us. A team of astronomers, led by Jim Geach, from the Centre for Astrophysics Research of the University of Hertfordshire, UK, has now used ALMA’s unparalleled ability to observe light from cool dust clouds in distant galaxies to peer deeply into LAB-1. This allowed them to pinpoint and resolve several sources of submillimetre emission. 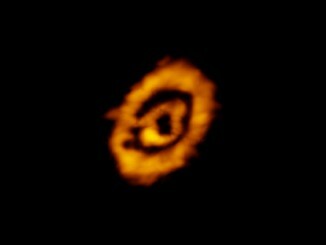 The astronomers then combined the ALMA images with observations from the Multi Unit Spectroscopic Explorer (MUSE) instrument mounted on ESO’s Very Large Telescope (VLT), which map the Lyman-alpha light. This showed that the ALMA sources are located in the very heart of the Lyman-alpha Blob, where they are forming stars at a rate over 100 times that of the Milky Way. This diagram explains how a Lyman-alpha Blob, one of the largest and brightest objects in the universe, shines. Click the graphic for a full-size version. Illustration credit: ESO/J. Geach. Deep imaging with the NASA/ESA Hubble Space Telescope and spectroscopy at the W. M. Keck Observatory also revealed that the ALMA sources are surrounded by numerous faint companion galaxies that could be bombarding the central ALMA sources with material, helping to drive their high star formation rates. 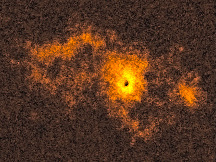 The team then turned to a sophisticated simulation of galaxy formation, known as the Feedback in Realistic Environments (FIRE), to demonstrate that the giant glowing cloud of Lyman-alpha emission can be explained if ultraviolet light produced by star formation in the ALMA sources scatters off the surrounding hydrogen gas. This would give rise to the Lyman-alpha Blob we see. 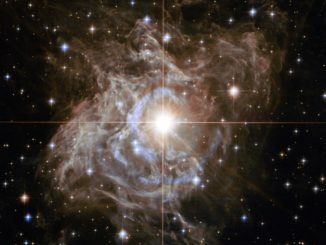 Understanding how galaxies form and evolve is a massive challenge. Astronomers think Lyman-alpha blobs are important because they seem to be the places where the most massive galaxies in the universe form. In particular, the extended Lyman-alpha glow provides information on what is happening in the primordial gas clouds surrounding young galaxies, a region that is very difficult to study, but critical to understand. Astronomers using the Atacama Large Millimeter/submillimetre Array (ALMA) have discovered two spectacular rings of molecules encircling the young, Sun-like star IM Lup. The rings are made up of one of the most common heavy ions in space — DCO+ (deuterium, carbon, oxygen). This chemistry reveals new insights into the conditions of the planet-forming disc surrounding this star. An international team of astronomers has discovered glowing gas clouds surrounding distant quasars. The new survey of these active galaxies indicates that haloes around quasars are far more common than expected. The properties of the haloes in this surprising find are also in striking disagreement with currently accepted theories of galaxy formation in the early universe.